I don’t like banana things. I like bananas…I take that back, I love actual, real life, peel and eat, yellow … and let’s be clear on the yellow…darkish yellow, not the new yellow that leads one to believe it was green just moments ago… they must be, ya know, perfectly ripe bananas. I just detest banana things. What does banana things include? I am so very glad you asked…you didn’t? Oh! Well…too bad. Banana chips or dried bananas – ya know, those thin slices of hardened fruit (errr dried) that are found primarily in trail mixes that inevitably result in the almonds, walnuts, cranberries, raisins, M&M’s (or chocolate buttons if you aren’t careful), and heaven knows what else they have thought to cram into trail mixes these days, taste like bananas. Gross. Gawdawful. Banana flavored Runts (or any banana ‘flavored’ candy). Who eats this stuff? It doesn’t even remotely taste like a banana. Have the creators of the infamous banana ‘flavor’ actually consumed a banana in their life? I think not. Banana flavored Laffy Taffy – NO! 1) It doesn’t taste like bananas and 2) Laffy Taffy never fails to numb my lips, resulting in me drooling on myself. Fact. Banana Splits. Bananas DO NOT belong in my ice cream. Brownies, cookies, nuts, cherries, strawberries…yes, go right ahead – join the ice cream party…but bananas, please stay at home, you are not welcome. And speaking of ice cream, banana flavored popsicles…who enjoys these so-called treats? Probably you…and I have now offended you, but I can’t be sorry because it is disgusting. 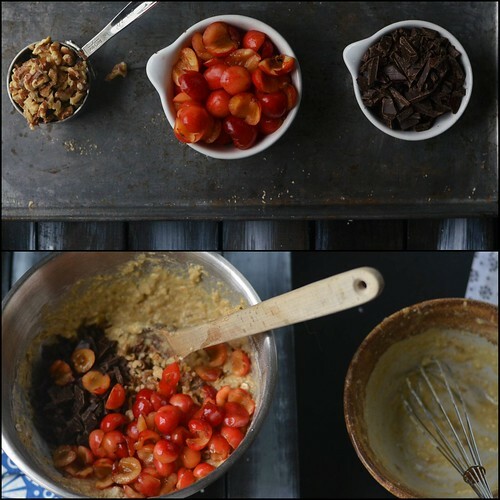 And have you seen on Pinterest these two ingredient banana cookies and banana frozen ‘yogurt’ or would it be ice cream? First, these are labeled as ‘healthy’…well, yes, bananas are healthy, or healthier than say a bag of potato chips or Oreos, however – they are chock full of sugar and eating a tray of banana cookies – which is inevitably what will happen when something is labeled healthy and is also a cookie…you will undoubtedly eat a dozen of them and still crave the damn chocolate chip cookie that you were trying to avoid in the first place, which would have been a wiser choice (because you would have only eaten 1, ha!) plus, it wouldn’t have tasted like a banana. Which leads me to the second point…why would you want a banana flavored cookie…just eat a banana or a cookie. No need to mash the two together. ACK! 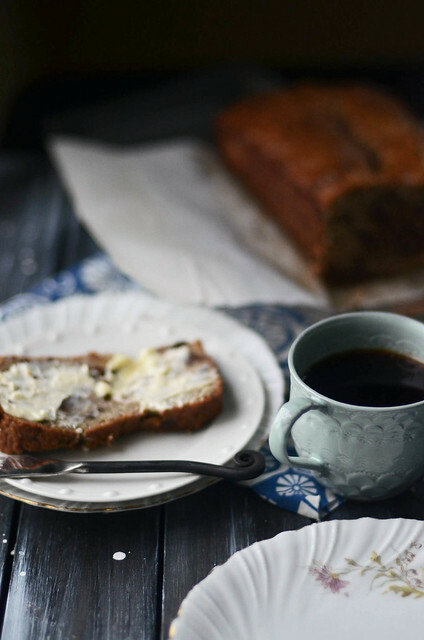 Banana bread/muffins/cakes/pancakes/waffles….No where near my cup of tea (or coffee – we are talking about me here…). Banana nut muffins are my morning nemesis. Mark this down…it is THE ONE sweet good that I will turn down given the chance ( not counting the banana cookies mentioned above)…. How come when heat is applied to a banana, all of its heavenly goodness is removed? Banana foster – no, just give me the pound cake and butter/sugar/caramel goodness and perhaps swap the bananas for peaches or apples. Or plums. Why bananas? Peach foster, please. There are slight exceptions to the rule…a plain old banana can be fancied up with a dollop of peanut butter or sliced and covered in chocolate hard shell sauce and frozen. And I think the chocolate bit needs emphasized…the bananas must be sliced and never placed whole on a stick, frozen, and dipped in chocolate, and then eaten in public. No one, and I mean NO ONE can pull off eating a chocolate covered banana on a stick in public. NO ONE! Maybe my head is in the gutter…it normally is…but come on! Get the point? 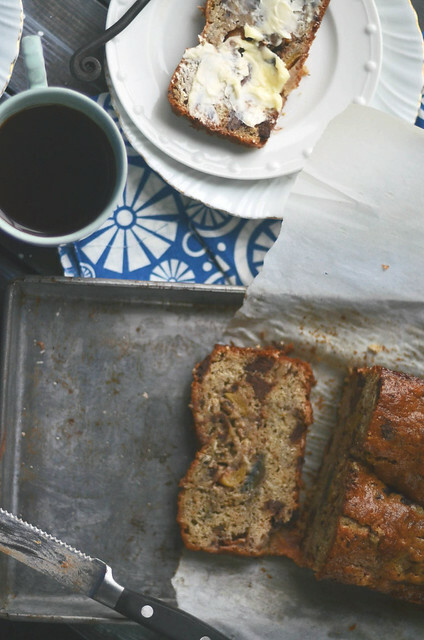 I greatly dislike bananas unless it is just a banana…so why do I continue to bake banana bread? Because I am bonkers and think that if I stuff more things into banana bread that I will actually enjoy it (next up, peanut butter banana bread?!? 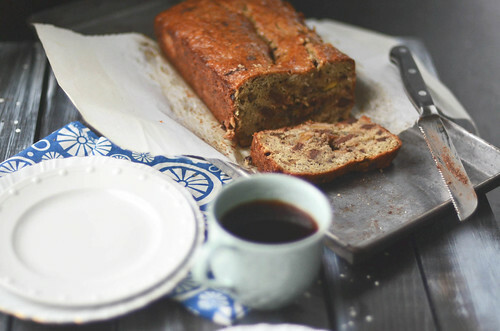 )…and honestly, this chocolate banana bread came pretty damn close and so did this chocolate banana zucchini bread…I think the common link here is the chocolate. 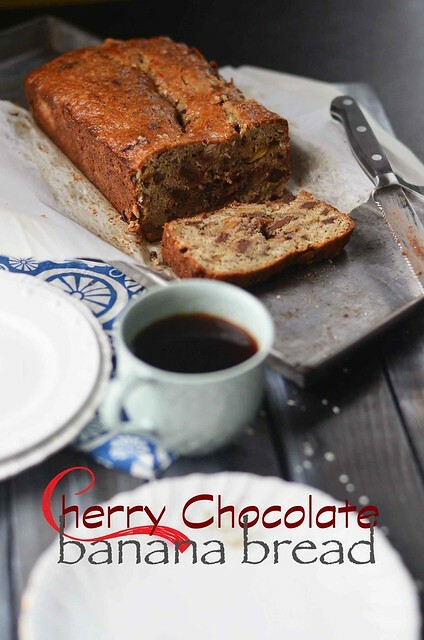 This go around, I stuffed cherries, chocolate (that was sea salted), and walnuts along side the bananas…Think Cherry Garcia Ice Cream, but with the addition of banana and well, bread. I don’t know. But I do know my older brother would have eaten the whole loaf given the chance, since cherry cordial ice cream is his favorite and he actually likes bananas in his ice cream or he likes bananas in his bread. What?!? All I know, he eats what I bake and well he didn’t get any….but he would have liked it. Those that were lucky enough to have this stuffed into their bags as they were leaving my house ( you don’t leave without a doggy bag made from my freezer) texted me as they arrived home, that the this bread was delicious and the chocolate made it nice and rich. I’ll have to take their word for it. 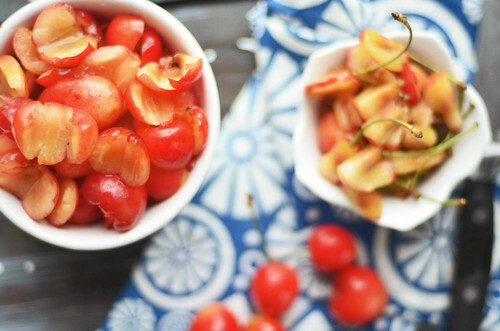 In a small bowl, toss together cherries and almond extract. Set aside. 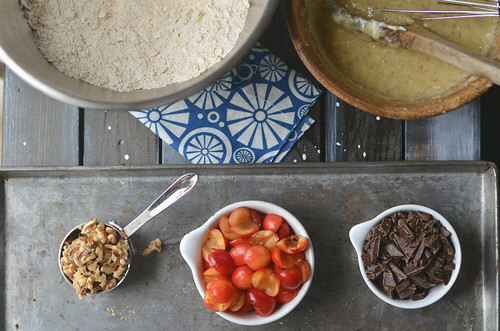 In a large bowl, whisk together flour, oats, baking soda, baking powder, salt, and brown sugar. Set aside. 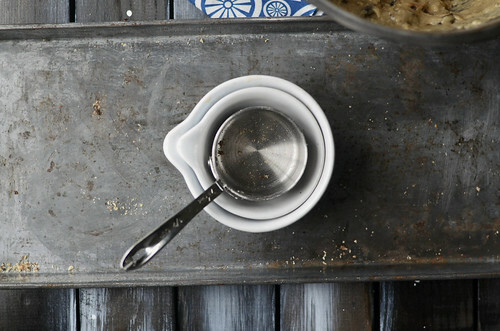 In a medium bowl using a wooden spoon, mix together melted butter and bananas. 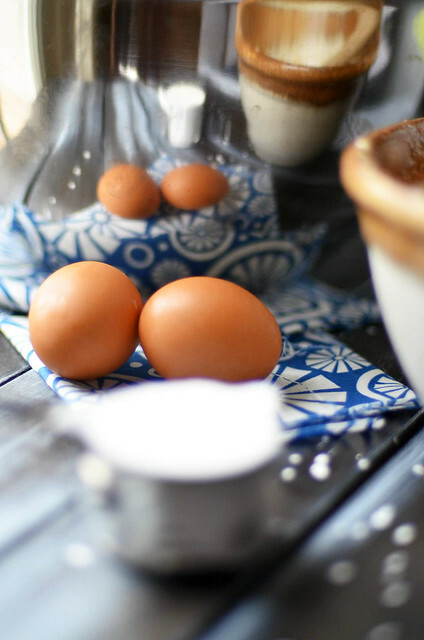 Blend in eggs and yogurt. Mix until everything is well combined. 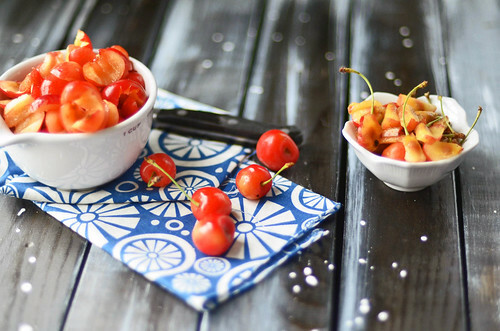 Fold in cherries (with any juice in bowl), toasted walnuts, and chocolate to batter. Pour batter (it'll be thick, so I use the term 'pour', lightly) into prepared loaf pan and place in preheated oven and bake until toothpick, when inserted near the middle comes out nearly clean with a few crumbs attached - about 50-60 minutes. Remove from oven and let cool on rack for about 20 minutes before inverting on wire rack and letting cool completely.